BARANGAY Ginebra may have lost to Star, 86-78, in its PBA season debut, but its fans found something to cheer about in Scottie Thompson. The rookie playmaker emerged as a bright spot in the loss, impressing the huge crowd in his pro debut with his heady play – at a time when the veteran guards failed to deliver – that allowed the Gin Kings to make a late comeback that just fell short. The former NCAA MVP out of Perpetual, who only had five practices with the Gin Kings, seemed to have jelled quickly with his teammates as he fed Greg Slaughter and Japeth Aguilar inside with his timely passes. He finished with five points, six assists, three boards, and two steals in just 16 minutes. “Ginawa ko lang yung best ko, yun lang talaga,” said Thompson, who delivered despite admitting of dealing with rookie jitters. 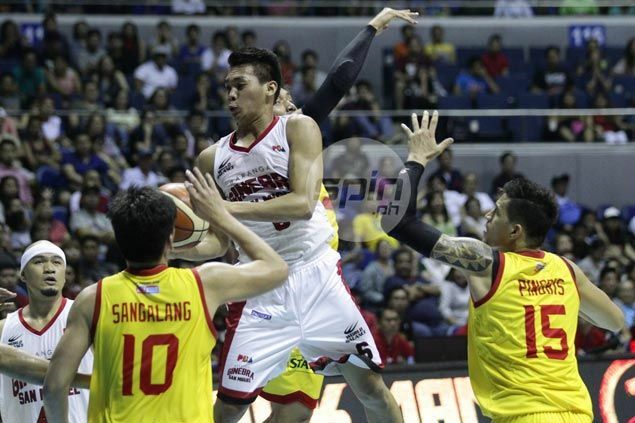 Gin Kings coach Tim Cone praised his young ward, this year’s fifth overall pick.